Pastor Clair Brubaker, known to many Grace Brethren for his years of serving at Hillwood Chapel in the Akron, Ohio, area, and for sending many young people from his church to Grace College and Seminary, has gone to be with the Lord. Here is the obituary. Rev. 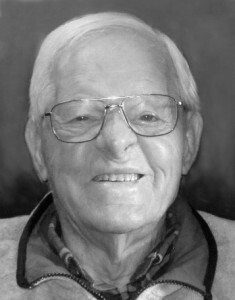 Clair Daniel Brubaker, 96, went to be with the Lord on Dec 7, 2010, after a brief illness. He was born in Duncansville, PA on January 15, 1914 to Daniel Brubaker and Mary Hoover Brubaker. As a young man, he moved to Akron OH where he met and married Ruth Kieffaber. He was drafted into the Army and served on the Italian front in World War II in the 337th Combat Team of the 85th Infantry. After the war, he attended the Akron Bible Institute and became pastor of a young congregation meeting in the Hillwood Homes Administration Building. He was Hillwood Chapel’s spiritual leader for more than 30 years. He loved the Lord above all else. Clair is preceded in death by his wife of 62 years, Ruth and his children John and Marion. He is survived by his three daughters, Evelyn Teykaerts of Cameron Park, CA; Martha Friesen of Fairfax, CA; and Nadine Howell of Fresno, CA. ; seven grandchildren, and one great-grandson. Funeral services were Wednesday at Hopkins Lawver Funeral Home, 547 Canton Road, Akron, with Rev. Walter Malick officiating. Private interment at Hillside Memorial Park.